Bus passengers in mid-Cornwall face reduced services in some areas and senseless duplication in other parts when Western Greyhound introduces new timetables at the end of March 2015. Currently, passengers in the clay villages have an hourly service to Truro (Western Greyhound 522). 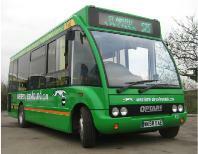 From 29 March, this will reduce to a two-hourly service. 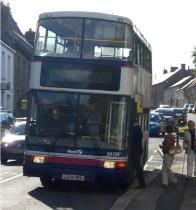 Passengers in Tregony have an hourly service to Truro (Western Greyhound 550 and 551). From 29 March, this will reduce to a two-hourly service; and residents in Veryan will lose their service completely as the 551 disappears. In contrast, passengers living on the Sticker, Grampound, Probus corridor currently have an hourly service to St Austell and Truro courtesy of the First 27 service. From 29 March, Western Greyhound will be running a 527 on the same route, also hourly, but running 5 minutes ahead of the First buses. Bob Egerton, Cornwall Councillor for Probus, Tregony and Grampound, said, "This is complete madness. Residents of the Roseland and the clay villages will get a significantly worse service. Residents of the St Austell-Truro corridor will not get a better service, just a pointless choice between two operators departing at virtually the same time as each other. This will be a bus war in which there will be no winners. This lunacy is only possible because bus services were de-regulated more than 20 years ago. The government must allow councils such as Cornwall Council to regulate bus services so that all residents can have an appropriate public transport service."